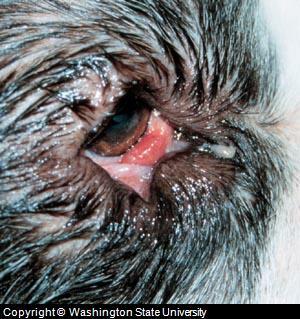 Dog eyes that appear reddened is a clinical symptom representing inflammation and/or infection. This may occur in different parts of the eye such as in the eyelids, conjunctiva, cornea, sclera etc. Infections, allergies and/or inflammation in these parts of dog eyes causes classical dog eye symptoms such as inflammation and redness, which is noted due to increased blood supply (hyperemia). Dog eyes may also appear red due to problems with the inner parts of the eyes, such as ulcerations, glaucoma, cancerous tissue growth etc. All of these conditions have the symptom dog red eyes in common. Dog eyes that appear red is what is known as a non specific symptom. It can represent a minor or major dog eye problem. Dog eyes may turn red as the result of inflammation in the eye and/or a dog eye infection. Classical signs of inflammation i.e. redness (due to an increased blood supply), swelling pain elevated temperature loss function are all noted in any minor or major infection or inflammation. Thus, reddened eyes in dogs are noted by the veterinarian. Hypermia, which mean an increased blood supply to the eye, is one of the five classic signs of inflammation. Symptoms such as irritation, pain, discomfort, scratching, eye discharge and specific signs for any problem in a portion of eye can also be exhibited along with a red eye. 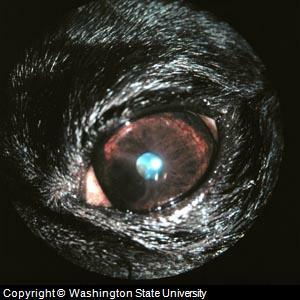 Clinically, dog eye problems can be identified by changes in eye coloration, but one cannot confirm the exact condition without accompanying symptoms or a detailed laboratory diagnosis. Dog eyes that appear red on the surface along with symptoms such as irritation, excessive tearing, discharge, scratching, discomfort and unusual dog eye blinking, should be considered a potential dog eye problem which can="" be="" anything from allergies, inflammation, and infections to any other complicated canine eye problem. Dog eyes that appear red over their surface along with symptoms such as irritation, excessive tearing, discharge, scratching, discomfort and unusual blinking of the eyes should be considered as potential dog eye problem. This can be anything from allergies to inflammation and infections to any other complicated dog eye problem. A veterinarian should closely examine the affected dog eyes with the help of an ophthalmic apparatus at a clinic. Further probing should be done with laboratory procedures. Laboratory tests are usually recommended on the basis of clinical observation. These dog eye test can be simple, such as examining dog eye discharge and culturing, tear tests, fluorescein tests (test using dye inside the eye), detailed x-rays etc. 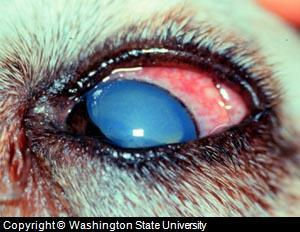 Dog eyes red is a symptom which may be exhibited along with several other signs. A dog owner should be aware of these primary symptoms. When exhibited, a dog should be referred to a veterinarian for a detailed examination. Since dog eyes are delicate organs, even minor conditions should be diagnosed properly. Once a clinical examination and a confirmatory diagnosis concludes, treatment of the underlying cause should be initiated at once. Specific treatment is done with the help of antibiotics, steroids and ophthalmic preparations. Sometimes surgery is needed to restore normal eye function and any anatomical defects. Symptomatic treatment, preventive measures and supportive treatment are also required for a complete and hastened recovery. During the treatment this is done with the help of anti inflammatory drugs, eye supplements, natural remedies and critical preventive care after recovery. Dogs with red eye are thought to have more sensitive eyes, therefore routine care, cleaning and use of supportive and natural remedies should be more frequent and used a regular basis. Good natural remedy choices to improve healing and maintain dog eye health include Eye Heal which can be used directly over the surface of the eye and i-Clenz which can be used to clean the areas around the eyes (eyelids, lashes and face) and to prevent any bacterial growth. Also, dogs that have sensitive eyes should see a veterinarian in 3 – 4 month intervals for a routine checkup.